Covering all of the major techniques, this book uses both metric and imperial units to illustrate the myriad drawing and editing tools for this popular application. Use the companion files to set up drawing exercises and projects and to see all of the book's figures. 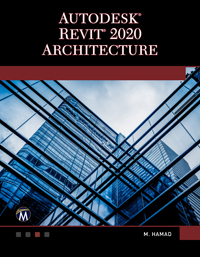 Revit 2020 Architecture includes over 50 "mini-workshops" that complete small projects from concept through actual plotting. Solving all of these workshops will help to master Revit Architecture from beginning to end, without overlooking any of the basic commands and functions. 1: Introduction to Revit Architecture. 2: How to Draw and Modify in Revit. 3: Project Preparation. 4: All You Need to Know about Walls. 5: Inserting Doors and Windows. 6: Creating and Controlling Curtain Walls. 7: Creating Floors. 8: Creating Roofs. 9: Components & Ceiling. 10: Creating Stairs, Ramps, and Railings. 11: Creating and Manipulating Views. 12: Annotation and Legends. 13: Visualize in Revit and Printing. 14: Creating Schedules. 15: Project Phasing and Design Options. 16: Toposurfaces in Revit. 17: Creating Rooms and Areas. 18: Tagging and Detailing. 19: Creating Groups and Revit Links. 20: Importing and Exporting Files in Revit. 21: Creating Masses in Revit. 22: Customizing Walls, Roofs, Floors, & Compound Ceilings. 23: Creating Families in Revit. 24: Customizing Doors, Windows, and Railing Families. 25: Worksets. Index. Munir Hamad is an AutoDesk® Approved Instructor and certified AutoDesk AutoCAD Master, who has authored several AutoCAD titles and taught various levels of AutoCAD training.